Keith Powers. Photo: Marc Cartwright. GALO: One of my favorites as well. KP: Dr. Dre was on the soundtrack for Friday. Ice Cube is in Friday. These dudes revolutionized music. They are entertainment for me, the first [taste] of entertainment. It’s crazy. When I booked the film, I didn’t understand the magnitude of how big it was at first. But then I go to the production office on the first day of rehearsal and Dr. Dre walks out of the office, and he looks at me and walks back in. Instantly, my stomach dropped. I felt like, “oh my God, this is for real.” And this is after he became a billionaire and teamed up with Apple. I mean, I’m just looking at him like, “whoa.” So then he comes out again and I meet him. He just looked at me and smiled. When we talked, I would get shy talking to him because of who he is. I think he would look at me because I reminded him so much of his brother — that’s what people around him told me anyway. It’s just crazy because his brother’s name is Tyree and my middle name is Tyree. GALO: I didn’t know that. That’s quite a coincidence; one might even call it kismet. KP: Yeah, and he even said something about how we had the same scar on our forehead. It got weird. But it’s crazy to play this character, especially once he approached me and I saw him, and I saw how much it meant to him. I picked his brain as much as I could and asked him how his brother was. Or he would tell my acting coach on set. I’m so honored to play Tyree. I’m a supporting lead in this movie, but I wouldn’t want any other role. For one, I know I wouldn’t fit into any other role, and you don’t want to mess with the story. Two, I wouldn’t want any other role because I get to be something significant to Dr. Dre forever. GALO: I would have to say that it is an amazing opportunity. After all, you’re able to bring his brother to life on screen and immortalize him there. What’s better than that? KP: Exactly, I get to give him something back after all the years in music and entertainment that he gave me. I think we also take entertainers for granted. Don’t get me wrong, I think sometimes they take their fans for granted, too. But I think we take entertainers for granted because we’re so used to seeing who we grew up with. Dr. Dre gave me The Chronic 2001. He gave me Eminem and 50 Cent. And he gave me 8 Mile (2002). It’s crazy to think about. He gave me all of these amazing things, and now I get to give him his little brother on film, in front of everybody. And from what I heard, he really liked my performance. I don’t think it has hit me yet. When that movie comes out, we’re going to have to see what happens after that. GALO: Well, the buzz is already incredible both from fans and the media. One can only imagine how big it will possibly become come opening day and thereafter. KP: It really is, and everybody worked so hard and stands behind it 100 percent. I think that’s such a big luxury when you’re doing a biopic, when everybody is behind something, it is like, “wow.” It’s what you need when you’re doing a biopic, because once one main person isn’t behind it 100 percent, you start getting false rumors and stuff like that. GALO: Like House Party, N.W.A. is a group that has been an essential component of American culture, especially hip-hop and black culture. Were you afraid of embodying a character that is based on a real person? KP: No, not really. But when I was on set, I made sure all of my stuff was on point. [I’d be] asking Gary, the director, “Is my acting good? Do you need something else?” So I’m not going to lie, I definitely made sure I was on point because you do wonder. GALO: So after that, I’m sure you felt good. KP: I didn’t really feel pressure. I was like, “man, let’s go! Let’s do this.” It wasn’t really a big stretch for me. I’m from the West Coast; my family comes from the hood. I’m not a street guy, but I’m from the hood. GALO: So what you’re saying is that you were aware of it, which perhaps made it a tad bit easier for you to embody it? KP: Yes, I was aware of everything, and I’ve seen these types of people growing up. That’s why I believe actors should start acting a little later in their lives — don’t do it when [you’re] too young. I think actors should experience certain things before they start acting. You know what I mean? GALO: Yes. Life experience both from personal encounters and observations can certainly make a difference in how an actor approaches a role. KP: Yes, they need to live, because then you can apply that to acting. GALO: Let’s talk about Sin City Saints. With the advent of streaming services like Hulu and Netflix, other platforms like Amazon and Yahoo have opted to produce their own original content. How did filming Saints differ from filming more traditional television series like Faking It? KP: Well, I guess I feel like the only difference is that when you do stuff on TV, you don’t finish a season so people can binge-watch it. When you’re doing stuff for TV, you get a chance to let the characters develop. You can see the audience’s reaction to certain things after. When you do something for a streaming service, you turn it in and that’s it. But I do feel like streaming is going to be the new wave of TV eventually. People want stuff faster now, that’s just what the world is cuing to with technology. So I do think streaming has come at the right time, because it gives people everything at once. Other than that, I don’t really see that there is a big difference. On set it is the same — it’s the same set up. It’s just the simple fact that you can binge-watch all of the episodes at once [that is different]. I actually like it because I can watch all of my work right after it’s out. What I like about Sin City Saints is the fact that you can pull up the app right on your phone and instantly watch the show. I think that’s so dope because when someone is like, “Oh, I want to see your show,” it’s just like, “here it is.” You can go to MTV.com for Faking It, but you have to wait for the episode to come out. I also love being on Sin City Saints because the talent of our cast is crazy. GALO: Was it exciting or nerve-wracking to return to the sports world in Sin City Saints? KP: It’s fun. It’s not a big stretch for me because I grew up around basketball. I was a football player but I played basketball. On the show, I get to be an NBA player. I felt like I was killing two birds with one stone. I got to be an actor and an athlete in a different world. It’s actually fun because it seems so real, the way they have the locker rooms and the jerseys. It’s definitely a luxury and a blessing. GALO: So, who are your role models? Is there any particular actor whose career you admire or look at as a model for your own? KP: Um, yeah, Brad Pitt. I love Brad Pitt. I just love the man he is, as far as him being a loving husband to his wife and having the kids and the big family. I just like the stuff he produces. Did he produce 12 Years a Slave? GALO: Yes, that was his company: Plan B Entertainment. GALO: [Laughs] That’s super cute! KP: [Laughs] He’s so dope. Also, Leonardo DiCaprio, because I feel like in the industry he plays by his own rules. GALO: Oh yes, he definitely does, for sure. KP: I kind of feel like that’s the reason why he doesn’t have an Oscar. I know that’s kind of crazy. GALO: He doesn’t need an Oscar. He’s Leo. Every time I see him in something, I get goosebumps. He’s an amazing, actor. KP: That’s what I’m saying. I don’t know if the Oscar is good enough for him. KP: Not to discredit the Oscars, obviously they’re important. GALO: Oh yes, when he got cast as the lead for Black Panther, I screamed. I’m so excited. KP: I also like Anthony Mackie and Michael B. Jordan. GALO: They’re great, too. I feel like we could play this naming game for hours or even days, given the amount of talented folks that are currently in Hollywood as well as those who are only starting to make a name for themselves. GALO: We can always learn more. I think as human beings, we’re learners and we should soak up as much as we can. KP: Yes, you should always stay a student to whatever you do, whatever craft. GALO: Very solid advice — words to live by! Well, to finish up, can you tell me anything about any upcoming projects that you are currently working on? KP: Yeah, right now, I’m shooting a show called Recovery Road for ABC Family. I also just agreed to do a movie in Russia. It’s a film called Maximum Impact starring Eric Roberts, Tom Arnold and Eddie Griffin. I also just starred in an episode of Fear of the Walking Dead — I’m going to be guest starring in the pilot when that airs in August. GALO: Oh cool, The Walking Dead spin-off? KP: Yeah, it’s crazy! It premieres in August, and the Straight Outta Compton [film] comes out on August 14. The new season of Faking It — the second part of season two that we shot already — airs August 31, and my birthday’s in August, too. GALO: Looks like you’re not only going to have an amazing summer, but an amazing month of August! KP: Yeah, the summer is going to be amazing! Right now, I’m shooting Recovery Road, and I’m going to do Maximum Impact in Russia in July. GALO: It’s good that you won’t be in a Russian winter. GALO: Well, congratulations on all of your incredible upcoming projects. I will definitely be looking out for all of them, and thank you so much for taking the time to speak with me. I really enjoyed this conversation. KP: Yes, thank you. I did, too. I appreciate it. Video courtesy of Universal Pictures. “Straight Outta Compton” opens in theaters on August 14. 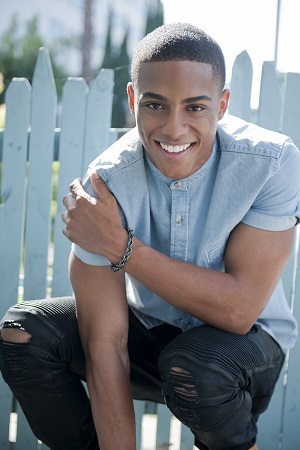 For more information about Keith Powers and his endeavors, you can follow him on Twitter @KeithTPowers.